International tourism exceeded expectations, last year, growing by 5%, to reach a record 1,087 million arrivals despite global economic challenges. Data released by the World Tourism Organisation shows that an additional 52 million international tourists travelled the world in 2013. The forecast for this year, is for a 4 to 4.5 percent growth - again, above the long term projections. Demand for international tourism was the strongest for destinations in Asia and the Pacific (+6%), Africa (+6%) and Europe (+5%). South-East Asia with a growth of 10% was the leading sub-region. As has been usual the past several years, in 2013, the tourism sector showed a remarkable capacity to adjust to the changing market conditions, fuelling growth and job creation around the world, despite the lingering economic and geopolitical challenges. Tourism has been among the few sectors generating positive news for many economies, according to industry analysts. The positive results of 2013, and the expected global economic improvement in 2014, have set the scene for another positive year for international tourism. The prospects are strongest for Asia and the Pacific (+5% to +6%). The Americas and Europe are each expected to grow by 3 to 4 percent. In absolute terms, Europe welcomed an additional 29 million international tourist arrivals in 2013, raising the total to 563 million. In relative terms, growth was the strongest in Asia and the Pacific (+6%), where the number of international tourists grew by 14 million to reach 248 million. South-East Asia (+10%) was the best performing sub-region, while growth was comparatively more moderate in South Asia (+5%), Oceania and North-East Asia (+4% each). The Americas (+4%) saw an increase of six million arrivals, reaching a total of 169 million. Among the 10 most important source markets in the world, Russia and China clearly stand out. 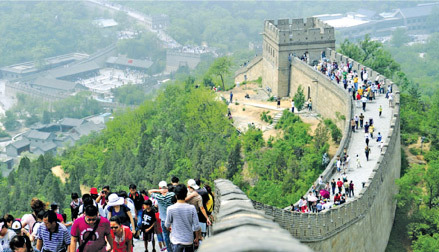 China, which became the largest outbound market in 2012 with an expenditure of US$ 102 billion, saw an increase in expenditure of 28% in the first three quarters of 2013. The Russian Federation, the fifth largest outbound market, reported 26 percent growth through September. The performance of key advanced economy source markets was comparatively more modest. France (+6%) recovered from a weak 2012 and the United States, the United Kingdom, Canada and Australia all grew at 3%. In contrast, Germany, Japan and Italy reported declines in outbound expenditure. Other emerging markets with substantial growth in outbound expenditure were Turkey (+24%), Qatar (+18%), Philippines (+18%), Kuwait, Indonesia, Ukraine and Brazil.